[Put on salvation as your helmet,] and take the sword of the Spirit, which is the word of God. This is the sixth of 7 “scenes” depicting each of the pieces of the armour mentioned by the apostle Paul. Putting on the whole armour of God protects us in the battles of life & faith. I enjoyed drawing & colouring up this illustration. 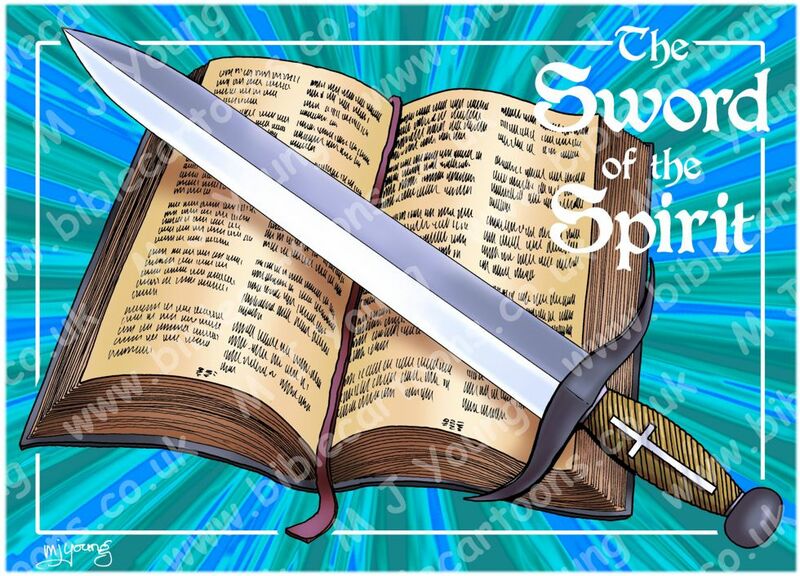 I wanted to combine the metal sword with the open leather bound Bible in the same picture, since the Bible (the Word of God) is referred to as The Sword of the Spirit in the above text. Sword of the Spirit: what is it & what’s it for? All of the Bible versions I have look at use the same phrase in describing the Sword of the Spirit. 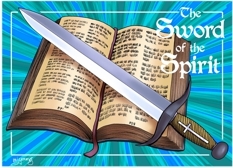 Application: why & how to wield the Sword of the Spirit? From the above references we see that the Sword of the Spirit is the Christian’s only offensive weapon. Really it is the Sword given to us by the Spirit. All the other items (Shield, Helmet, Breastplate, etc) are for our own defensive protection. In a military sense, we get the image of a soldier spending countless hours practising with his weapons, to become adept, swift & deadly in their use. Then he or she can move from being aware of themselves wielding those weapons to becoming automatic in their use: the sword becoming an extension of the soldier; the soldier becoming the sword. In the same way we Christians need to read, re-read & re-re-read the Bible, with the aim of becoming so adept at using it (in defence of ourselves & attacking the spiritual forces of evil in our world) that we become an extension of God’s will & way here on earth. That is the essence of what Paul was telling Timothy in 2 Timothy 2:15. The Sword of the Spirit is the Holy Bible, the Word of God. In order to accurately & effectively use this weapon, we need to 1) read & get to know it & 2) to practice using it. Taking the military metaphor again, imagine a soldier going into battle with a sword he or she had never used, perhaps never even lifted out of its scabbard before, facing expert swordsmen, well versed with their own weapons. Who would you expect to win that fight?! Based on that simple metaphor, it should be obvious why we Christians need to read the Bible, become familiar with it & fearlessly wield it. Like a swordsman who spends endless hours swinging his sword in practice strokes, learning to cut, thrust & parry with increasing skill, we also need to practice wielding the Word of God (the Holy Bible) until we become equally proficient with it as our Sword of the Spirit. From this commentary we can see that we are to tell people who do not know what the Bible says about this amazingly rich source of life & power. We can only effectively do that once we have put on the full armour of God, in order to protect ourselves from spiritual counter-attack by the forces of evil & darkness.